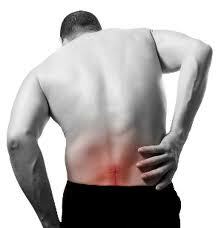 Variable back pain that comes and goes, often affected by weather changes, activity level, diet, etc. Early morning stiffness of the spine, that also experienced after prolonged inactivity; this improves with activity, but can be worsened by too much activity. At the front of each spinal vertebra is the part that looks like a large building block called the vertebral body. Each vertebra is connected to a vertebra above it and below it by meeting at the flat surface of the vertebral body by means of the vertebral disc; where two vertebral bodies meet there is a disc in between them, creating an intervertebral disc joint. In the back of each spinal vertebra is another point of connection so each vertebra can connect to the vertebra above it and below it by means of a hinge-like boney structure called a facet; where two of these facets meet it is called a facet joint. Arthritis can develop in the joint large joint between two vertebral bodies, and arthritis can develop between in the hinge-like facet joint. Typical accidents, injuries and strains occur in the joint between the vertebral bodies, due to normal daily activities such as lifting, bending and standing – this is called spondylitis of the disc. Spondylitis is an acute or temporary form of arthritis in the spine as a result of a recent injury. As spondylitis continues throughout life in a person, the vertebral discs start to show the effects of wear and tear, and they start to get thinner and weaker as part of the aging process – this is called spondylosis of the disc, or disc degeneration or degenerative disc disease. Spondylosis is a chronic or long-term form of arthritis in the spine as a result of deterioration that will not change and is thought of as permanent. It is also called lumbar osteoarthritis when it affects the low back, and cervical osteoarthritis when it affects the neck. As spondylosis of the disc continues to advance, the space between vertebra is reduced and the facet joints are allowed to come closer to each other and no longer line up correctly. This irritates the facets and causes pain, swelling and stiffness of these joints – and this is called a facet syndrome. As the facet syndrome continues to advance spurs of bone are formed around the facets. These spurs grow larger and close off the space around the opening for the spinal cord and spinal branches, and press on the nerves in a painful way – and this is called spinal stenosis. After a while all of these different changes in the spine – spondylitis, spondylosis, facet syndrome and spinal stenosis – are going on at the same time, in different places of the lower back, neck, or between the shoulders, and in different stages of progression. The bottom line is that the person who has all of this happening in the back is stiff, sore, in pain and can predict the weather. Put it all together and it is called arthritis of the back or lumbar osteoarthritis of the spine. As we see osteoarthritis of the spine advances slowly for some people and rapidly for others, but always advances. This advancement is due to the progressive nature of permanent changes in the bone and soft tissues in and around the spinal joints backbone. For this reason treatment tends to be ongoing and somewhat permanent also, with occasional increases or decreases as symptoms demand. Therefore it is wise for someone with arthritis in the back to be careful when selecting what type of treatment is used for back arthritis since it will be used for a long while. If the wrong type of treatment is selected it can either make the spinal arthritis worse, or cause an entirely new array of health problems as a result of side effects and complications of treatment . Topical ointments and creams – Ben-Gay, Aspercreme, etc. Non-prescription drugs – over-the-counter products; acetaminophen (Tylenol), non-steroidal anti-inflammatory drugs (NSAIDs) such as aspirin, naproxen sodium (Aleve), and ibuprofen (Motrin or Advil). NSAIDs uncommonly have serious side effects – gastric irritation and bleeding, liver, brain, and kidney damage. Prescription drugs – painkillers, mild narcotics, or injections of steroids into the joint, oral steroids are not commonly used. Injections into the space surrounding the spinal cord are being used more often but do not correct the underlying problem and are sometimes used without clear indication of long-term benefit. Surgery to reduce bony, nerve and soft tissue pressure in areas of spinal osteoarthritis. How can I help my spinal arthritis and degenerative disc disease?